Right now, the NY Times home page has no mention of the anti-war demonstration here in NYC (we just got back but it's not finished yet). Instead they have a photo of G.W. Bush at a rally in Florida. The Times doesn't want to acknowledge that such as thing is happening in the city, but it's hard to ignore 100,000 marchers. There is a small link lower down on the page under another Iraq story about worldwide demonstrations, but if fails to mention the New York one. Newsday has an AP story, which is where I got the 100,000 number. Also, on the page with the story is a link to a photo gallery. James now has a photo gallery of his own up. Listed below are links to blogs that reference this entry: Not fit to print. 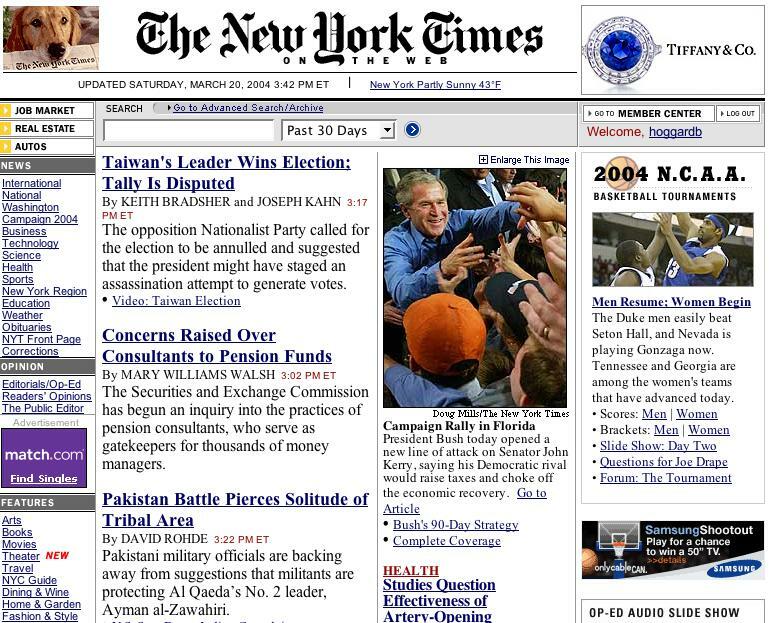 Published on March 20, 2004 4:00 PM.